Rundgren’s long-awaited autobiography The Individualist, was released on December 21. He embarks on the world’s first hybrid concert/book tour this coming spring, highlighting music across his 50-year career. Born and raised in Philadelphia, Rundgren began playing guitar as a teenager, going on to found and front The Nazz, the quintessential `60’s psychedelic group. In 1969, he left the band to pursue a solo career, recording his debut offering, the legendary Runt. But it was 1972’s seminal Something/Anything?, on which he played all the instruments, sang all the vocal parts, and acted as his own producer, that catapulted Todd into the superstar limelight, prompting the press to unanimously dub him ‘Rock’s New Wunderkind’. It was followed by such landmark LPs as The Hermit of Mink Hollow and the above mentioned A Wizard, A True Star, as well as such hit singles as I Saw The Light, Hello It’s Me, Can We Still Be Friends, and Bang The Drum. 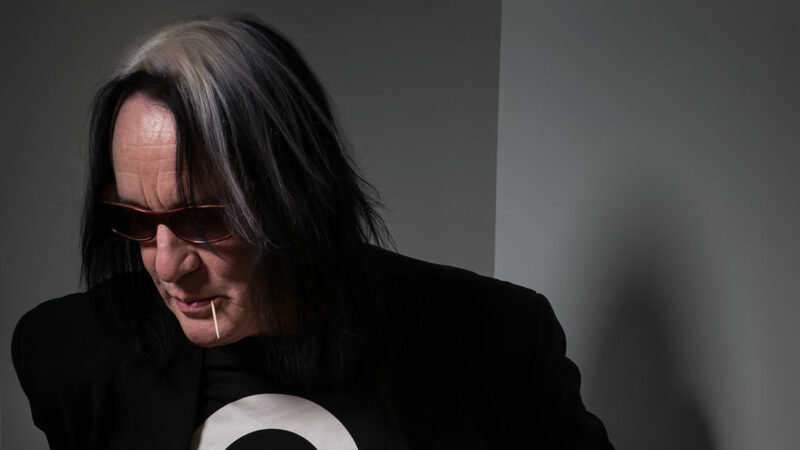 In 1974, Todd formed Todd Rundgren’s Utopia (renamed and reconfigured in 1976 as Utopia), an entirely new approach to the concept of interactive musicianship, and embarked on an extensive round of touring and recording. Standout Utopia offerings included Oops! Wrong Planet, Adventures in Utopia, and Oblivion. Along the way, Todd Rundgren’s Utopia combined technical virtuosity and creative passion to create music that initially, for millions, defined the term “progressive rock”, and subsequently, as Utopia, the term “powerpop”. In 2012 Rundgren performed his iconic 1973 album A Wizard A True Star in concert in its entirety for the first time ever, and several years later did the same with a double bill: Todd & Healing. He has toured with Ringo Starr as an erstwhile member of the All-Starr Band since 1989, and continues to perform with symphony orchestras both domestically and internationally. His latest studio album, White Knight, was released last May 2018, and last spring he toured North America with original Utopians Kasim Sulton and Willie Wilcox for the first time in 33 years. His long-awaited autobiography The Individualist, was released on December 21. He embarks on the world’s first hybrid concert/book tour this coming spring, highlighting music across his 50-year career. Last year on successive weekends he was awarded honorary doctorates from both the Berklee School of Music and DePaul University.